Well, we've reached another Wednesday and less than a week to Saint Patrick's Day. I must admit that when I think about Saint Patrick's Day the first thing that comes to mind is a pint of Guineas, straight from the tap in a good old Irish Pub. sigh!. In the absence of Guineas, I've turned to chocolate and made some simple choc chip cookies with green m&m's. 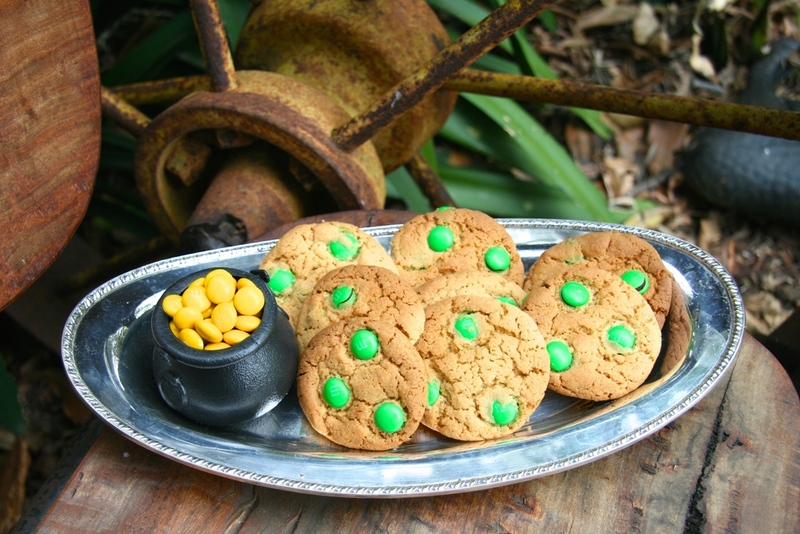 These little treats are a simple and easy way to celebrate Saint Patrick's Day. With the remaining yellow m&m's I've created a pot of gold that should help me catch any leprechauns that are hiding in my garden. Pre heat oven to 160 c.
Cream the butter and sugar's. Fold in flour and green m&m's. Place teaspoons of mixture on a baking tray lined with Baking Paper.